The Chateau is absolutely breathtaking! The front is covered in gold. We didn't want to go inside once we saw the gardens. Acres and acres of beautifully landscaped park. 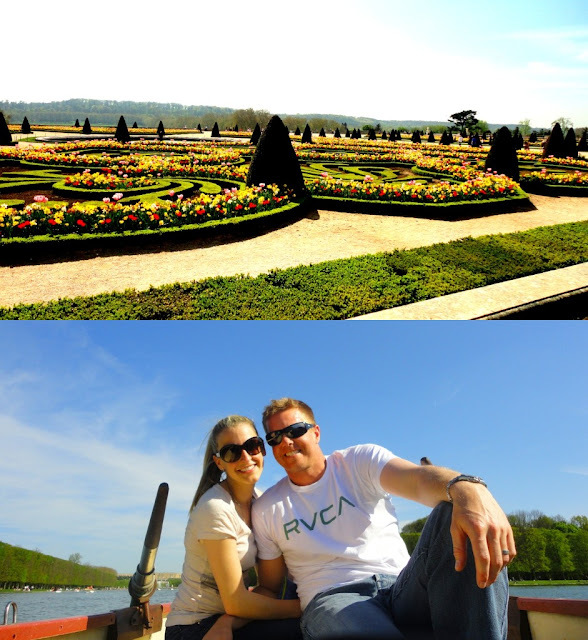 It was one of the largest and most beautiful gardens I will probably ever see! Map of the gardens, courtesy. The Chateau from the front and the back. The gardens weren't complete, but I loved the thousands of tulips! The Neptune Fountain was spectacular. It only goes on once per day for about 20 minutes. 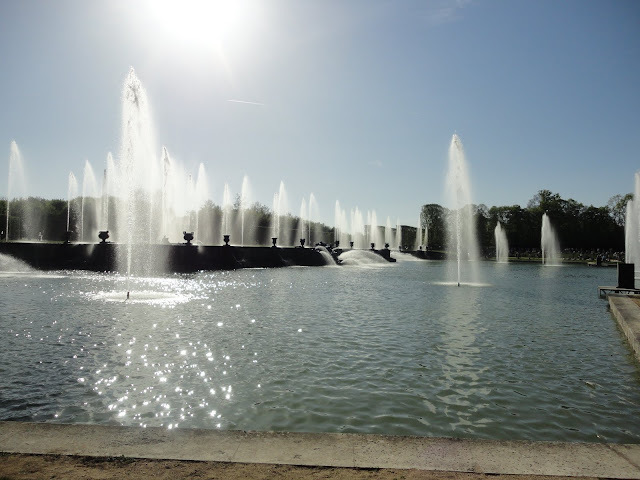 The incredible thing about these fountains is the piping and their age. They've been original since the Chateau was built in 17th Century! We walked at least 3-5 miles that day through the passage ways. Everywhere you turned was another fountain, garden, or sculpture. 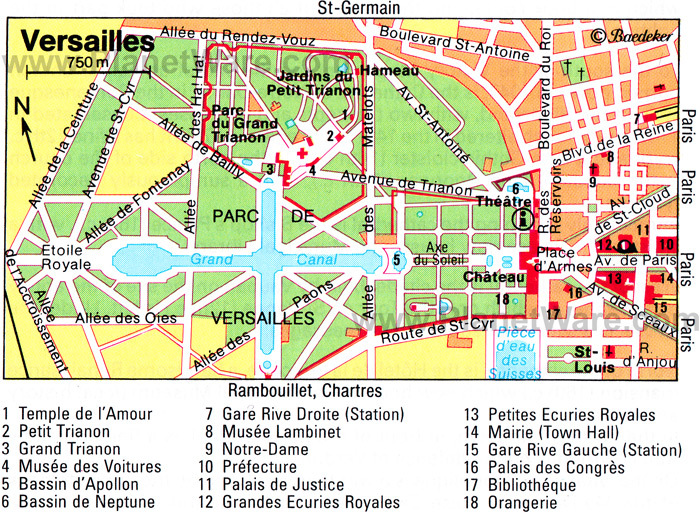 If you ever get the chance to visit Paris, I strongly recommend taking the 30 minute train ride over here. It is magnificent! Those pictures are gorgeous! I would LOVE to go to Paris one day!! and how fun you got to go on a row boat!! Versailles is the only thing I really care about seeing in France! I have read every Marie Antionette biography and I can't wait to see it in real life! Amazing is that the garden where they filmed the man in the Iron Mask? You look like you are having the time of your life .. and I love that shot of the tree lined avenue!! fabulous! This was my favorite part of my trip to Paris. Hands down. In fact, it's about the only part I remember! I loved it there! Great pictures! OH my goodness! 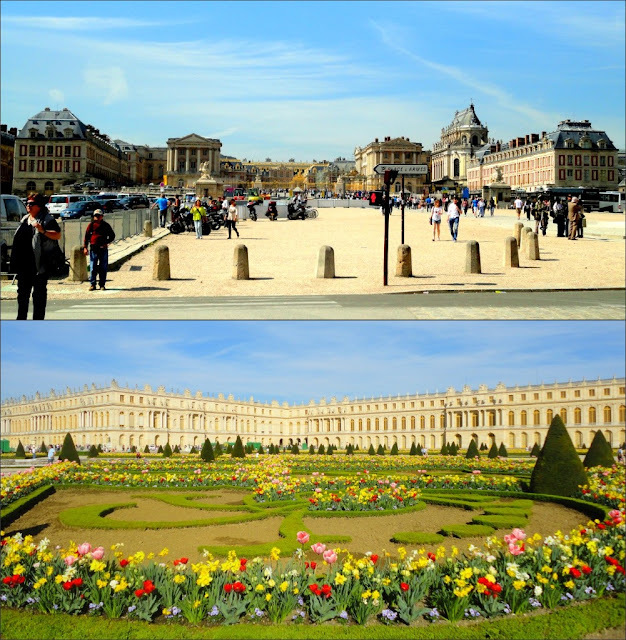 Versailles is one of my favorite memories from my high school trip to Europe! Beautiful! your pictures are beautiful. I love all the tulips. That place looks gorgeous! And lucky you on the weather! :-) I could probably spend all day there too! 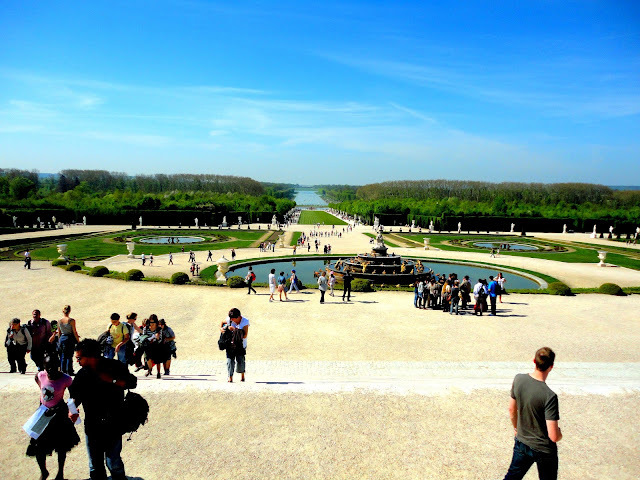 I have always heard that France is not one of the top places to visit, but Versailles looks absolutely breathtaking. Now that would be a place in France that I would love to visit - I hope you really enjoyed or are enjoying your trip!!! The photos look amazing! It looks like it was such a beautiful day and a great place to be! Oh how gorgeous!!! What an exciting time for me to stumble across your blog - thanks so much for commenting on mine last week and leading me here! YES - we are fellow SFSU'ers! I was there from 2005 - 2007. Did we overlap? I hope that you guys have a great rest of your trip!! Gorgeous!!! The day I was in Paris I've never walked so much in my life :) but it was worth it!! What lovely pictures these are! I would love to visit the Neptune Fountain! Just lovely! When Nick and I went it was in November so none of the flowers were bloomed like they were for you. We said we must go back when the flowers were out! How pretty! 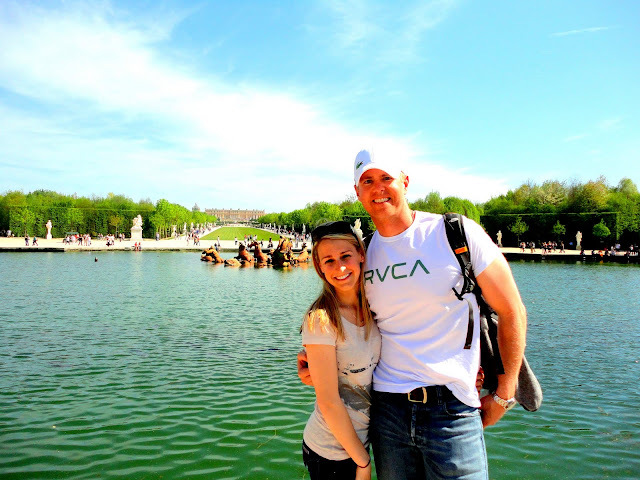 I can't wait to go back to Europe! It looks so beautiful! We never got a chance to visit it, but now I know that we will definitely have to go back one day. 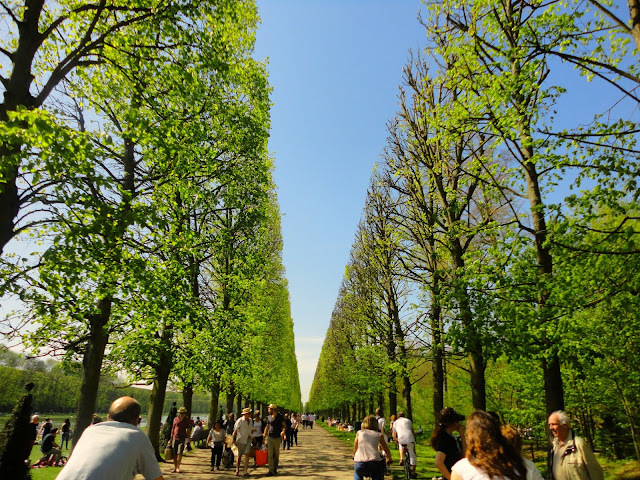 I love the picture of the same height trees, looking down the pathway, it looks so surreal! Ah I am really enjoying living vicariously through your travels right now! Thats awesome you caught the fountain turning the 20 minute show!! Its beautiful! I loved Versailles. It's just amazing when you think about how long ago everything was built. It left me speechless. I absolutely loved Versailles when I was in Paris! Your pics brought back such good memories!! It certainly looks magnificent! Gorgeous views and it sounds like you got some good exercise too!